In Part 1, we looked at ability scores and established a few useful rules for assigning them to monsters of your own design. In this part, we look at Hit Dice and hit points as they relate to challenge rating and extract a few lessons about monster defenses. In the earliest editions of D&D, Hit Dice (HD) were a direct measure of a monster’s toughness. If you knew how many HD a monster had, you knew a third of everything you needed to know about it. Fill in its AC and the damage from its attacks, and you were nearly done. Hit Dice became less and less important over the years until they all but vanished from the game. It’s refreshing to see them make a comeback. Hit Dice are no better or worse than level for measuring a monster’s overall toughness, but for reactionary traditionalists like me, it’s nice to see a classic concept back in play. Just as important as the average are the minimum and maximum numbers of Hit Dice that appear in the Monster Manual at each CR. That’s why each CR on the chart is represented by a vertical bar with an upper, middle, and lower number. The middle number is the average; the upper and lower numbers are the maximum and the minimum. 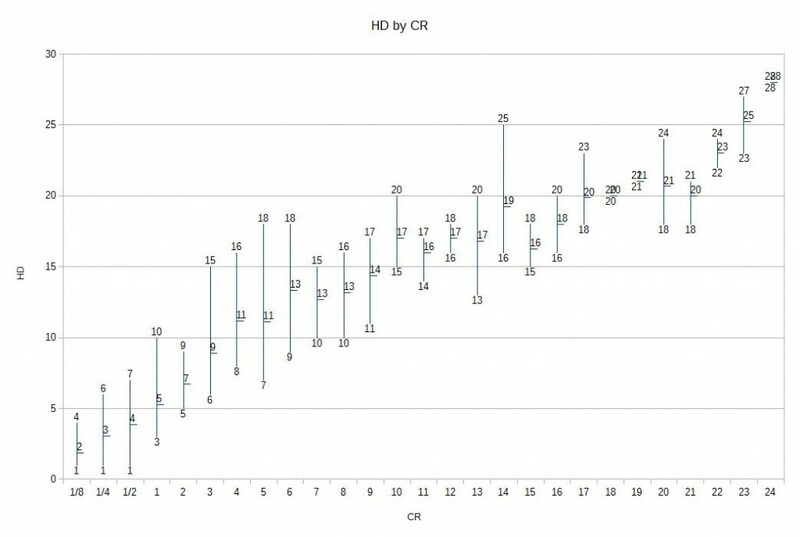 The data are more reliable at the lower end of the CR scale because there are more monsters at those CRs. In contrast, look at CR 18, 19, and 24; the maximum, minimum, and average are identical at those points. CRs 18 and 19 are represented by only one creature apiece (demilich and balor) and CR 24 has just two (ancient gold and red dragons, both with 28 HD). Above CR 24, there’s a gap with no monsters at all until the tarrasque appears at CR 30; the chart ends at CR 24, because there’s not enough data to say anything meaningful beyond that point (and barely enough to say anything even there). The minimums and maximums are important because they establish the . . . well, the minimums and maximums. It’s possible that I’m being too traditional here, but Hit Dice say something about a monster’s toughness beyond merely determining how many hit points it has. In reviewing and developing monster stat blocks, I’ve seen many cases where a designer gave a low-CR monster far more Hit Dice than any comparable creature in the Monster Manual. In every case, this was done to boost its defensive CR, either to lift the monster above a weak offensive CR or to prevent a weak defensive CR from dragging it down overall. If everything about your monster points to CR 5 but it needs 25 Hit Dice to justify that rating, then something else is wrong. Maybe its offense is too weak; maybe it needs a trait or a special defense to distinguish it; maybe it just isn’t a CR 5 monster at heart and it should be downgraded to CR 4, 3, or lower. Some types of creatures simply don’t function well at certain CRs without excessive amounts of padding or squeezing—and no matter how you disguise them, padding and squeezing always stand out to sharp-eyed players. Size affects Hit Dice as you’d expect; bigger monsters tend to have higher CRs and more Hit Dice. Small and Tiny monsters tend to have low CRs and few Hit Dice, but there’s a hitch. A Small monster and a Large monster with the same CR will have very different stats, because the Large monster gets on average 2 more hit points per Hit Die, leading to a correspondingly higher defensive CR from the same foundation. Designing a Small or Tiny monster with a high CR is tough, because six-sided or four-sided Hit Dice force its defensive CR down. The only fix is to jack up its offensive CR to compensate, or to give it a ridiculous number of Hit Dice or boost its Constitution beyond reason. 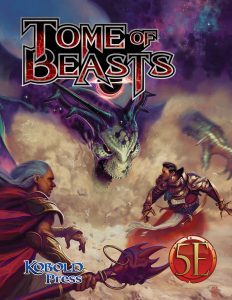 A creature the size of a fox but with the Constitution and Hit Dice of a purple worm is hard to rationalize in fifth edition’s naturalistic approach to ability scores, as discussed in part 1 of this series</a>. Most Tiny creatures in the MM have 4 or fewer Hit Dice. 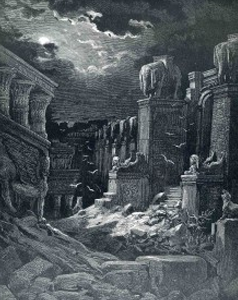 The only exceptions are the intellect devourer, will-o’-wisp, flameskull, and demilich: two floating skulls, a shambling brain, and a ball of light. It’s no surprise that more Hit Dice equate directly to more hit points. We don’t need charts or equations to make that point. What’s more interesting is comparing the actual hit points of creatures in the Monster Manual to the hit point totals suggested by the Monster Statistics by Challenge Rating table in the Dungeon Master’s Guide. Chart 2 does exactly that. The red line is the suggested (maximum) number of hit points at each CR, and the blue line is the average number of hit points as derived from actual stat blocks. When oddities like the demilich at CR 18 are factored out, the blue line (MM) averages about two-thirds the value of the red line (DMG)—or looked at from the other side, the DMG suggests hit point values about 1.5 times higher than what’s found in the MM. That doesn’t mean the MM’s hit point values are wrong. 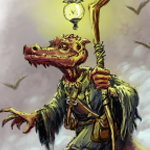 It suggests that official monsters glean a significant part of their defensive CR from something other than hit points. Armor Class, resistances and immunities, saving throws, traits, and other features can all boost a monster’s defensive CR. Chart 2 suggests that about one-third of a monster’s “effective hit points” should arise from factors other than straight-up hit points. This can vary enormously. Some monsters have no defensive tricks at all, while others have defensive capabilities that far outstrip their hit point tallies. The monster-building rule to draw from this is that monsters with mountains of hit points and little else in their corner tend to be dull, consistent losers. Great article with some great charts! P.S. 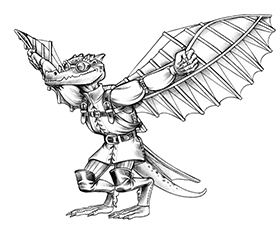 : Please bring back Monster Mondays, Kobold Press! Found it, feel like an idiot. Sorry. 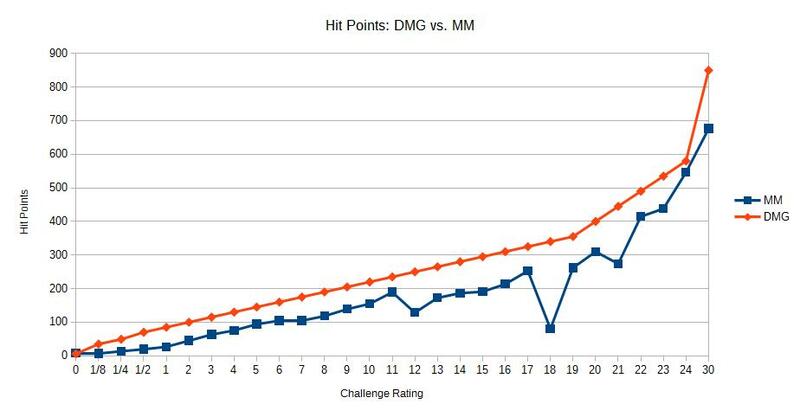 I guess the difference in HP from MM to DMG is that you show the DMG maximum, and the MM average. If you see they are 1.5 higher, maybe the minimum will be about 0.5 the average. There’s this margin so DMs can fine tune during play.